Deposits are being taken to reserve. They will be 8 weeks 5/21/2014. 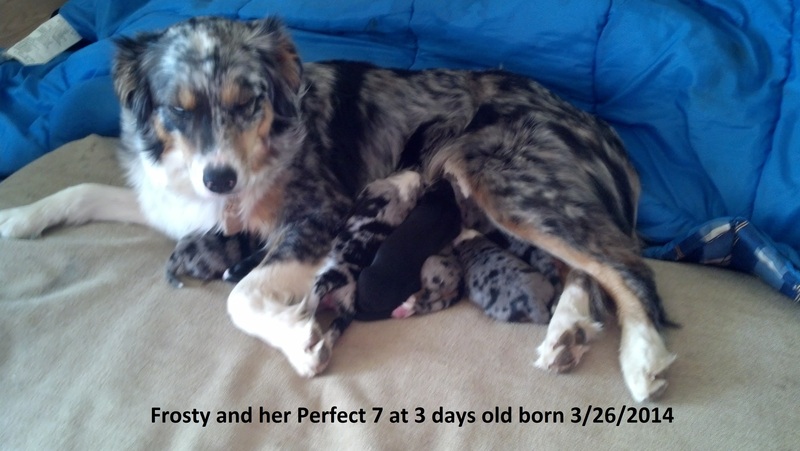 Check out our “About CC Heart Ranch Australian Shepherds” page for contact form. I look forward to sharing our family with yours. Additional photos and videos will come as pups get older. Jake and FrostyUPDATES: Added a few more photos (above). More videos links of puppies at 6 weeks old (added below). UPDATES: 5/7/2014 Added a few more photos (above). More videos links of puppies at 6 weeks old (added below). Previous PostCatahoula Hound working cattle dogsNext PostThe Great Eight Catahoula Hound Cattle Dog Puppies! Hi, I am interested in Mr. Clean. Is he still available? How do I get more details about him? I love that story about how he got his name. I know in some cases that deaf and blindness occur in merle coloration puppies…does Mr. Clean have either one? How do we meet the puppy? I am trying to find contact information on your blog but cannot seem to locate it. Thank you for such a quick response. I couldn’t find my contact/about page either. I don’t know where the link went but it is there at trueworkingdogs.wordpress.com/about. Thanks for letting me know. I’ll add a direct link in the blog post. Puppies can be seen at the ranch located in the Tonto National Forest N of Cave Creek/Carefree/Scottsdale, Arizona. No formal contract yet. I sent details about deposits and make sure we both have our questions & concerns answered before I accept a deposit. No deafness or blindness in any of our puppies. We will guarantee that. It is most likely with Merle on Merle breeding (especially if several generations of Merles on Merles) and pups typically have too much white. If you don’t know at birth it is an issue, it is quickly apparent. This subject can definitely be Googled for more detailed education. My husband has more experience as an Aussie breeder many, many years ago and even then he didn’t encounter it often with Merle on Merle breeding. We will never offer a puppy like that for sale for multiple reasons and work to avoid the issue all together in our breeding program. Hi, I am wondering if the black female aussie is still available? Please contact [contact details removed for privacy]. Thank you! The black bi aussie female “Daddy’s Girl” (Miss Jake 2 per my 5 year old) is my 5 year old’s favorite. She is currently available though many interested and waiting for the updated pictures I added today.